Kizoa offers 3 ways to create a collage: choose a template, use the magic collage (premium users only), and from scratch. We will only discuss about making collages from templates and from scratch. There are 100 over templates in Kizoa, but only 18 of them are free from various categories such as Christmas, new year, spring, graduation, holiday, love & marriage, and more. After choosing a template, simply add photos into the template and you are done! 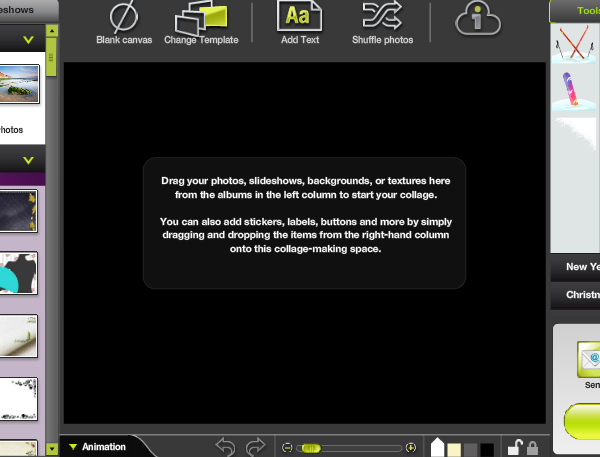 You can also customize the collage by changing the backgrounds, adding text, shuffling photos, adding shapes, etc. Doesn’t like the template? You can always change the template to replace the existing one. Besides, it is amazingly easy to change your static collage into an animated collage. Under “Animation“, click on the “Animation Magic” icon and your collage is now both static and animated, with newly added trajectories and effects. Add music and extra effect too if you want. In my opinion, it is much harder to create collage from scratch, as you need to add every elements by your own. Nevertheless, there are few good backgrounds that are worth to try, if you have the time and really want to design your own collage. Some of the collage templates are really creative and gorgeous, which makes creating a beautiful collage much easier. 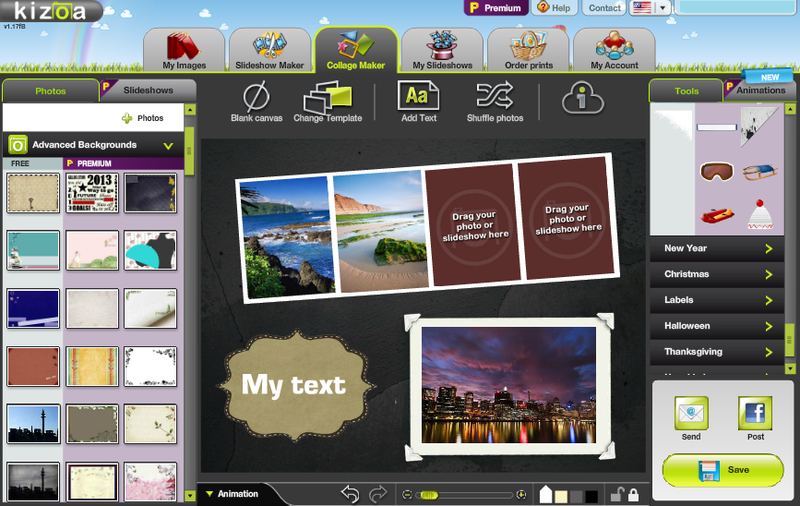 Kizoa’s collage maker is also a great place to create animated collage. However, it is impossible to create shaped collage with Kizoa. I also don’t recommend you to create a collage from scratch. Is this strictly an online service or can I purchase the software to work offline?